Besides being a water source, rivers also contribute to our lives in numerous ways. In fact, we are very intimately intertwined with rivers as they affect us culturally, socially and economically. We rely on rivers for our food resources, and the livelihoods of riverine communities in particular are significantly dependent on rivers. We utilise rivers as means of transport and navigation routes, to generate hydroelectric power, to irrigate agricultural land, as centres for establishing new settlements and for recreation. Rivers provide important habitats and serve as feeding and breeding grounds for a wide range of riverine biodiversity that lives in the river as well as in the river-fringing vegetation. Rivers also form a key component of our environment and landscape. They provide the means for delivering water to every corner of the earth and are vital for the healthy functioning of nature itself. As our country thrives, great pressure is imposed onto natural ecosystems including rivers. Many of our river systems have been subjected to changes by human interference resulting in negative implications. This includes deterioration of freshwater habitats and their ecological processes. WWF-Malaysia realises that to address this situation would require changing the currently fragmented way of managing water resources and the associated freshwater ecosystems at river basin level to one that adopts a holistic view that goes beyond the sectoral approach. A holistic and integrated approach to management of rivers and river basins requires ecological considerations. 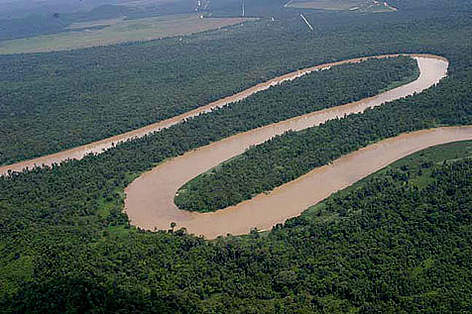 Ecological elements and conditions reflect the livingness or health of a river and its basin. IRBM places emphasis on sustaining the livingness of the river because it ensures a continuous flow of water for a multitude of beneficial uses and the capacity to respond to future needs. The health of a river is measured by the status of its ecological resources and its capacity to perform ecological processes. A river basin is the land between the source and the mouth of a river, including all the areas that drain into the river. River basins are therefore based on natural, hydrological boundaries rather than on administrative or political divisions, and are the most appropriate units for the planning, conservation and sustainable use of freshwater resources and ecosystems. Because river basins comprise of every square metre of land or water in the catchment of a given river system, their sustainable management depends on suitable approaches to agriculture, forestry, land use planning and other uses from mountain areas to floodplains, to coastal zones. By their very nature, river basins require management that is integrated at all levels, namely integrated water resources management (IWRM) and integrated river basin management (IRBM). IWRM is the coordinated management of water and related land resources in the natural environment, using river basins as a geographical unit with the objective of balancing human needs and conserving resources to ensure their sustainability. IRBM is the coordinated use and management of land, water and other natural resources and activities within a river basin, to ensure their sustainability and productivity. Both the IWRM and IRBM approaches reflect common notions on integration within and between sectors to achieve wiser and more sustainable use of freshwater resource and ecosystem. A practical tool for implementing IWRM at the river basin level is through IRBM.